Sometimes, the best Overwatch moments are the most unexpected. The happy accidents, the ones where you discover a totally new way to approach the game, are just one reason behind this game’s blockbuster success. Read on for five amazing examples in action! 1. You shall not pass! Forget fancy tactics or precision skills. Here, Roadhog manages to take out an enemy Mercy just by standing in the doorway and blocking her path. Roadhog’s girth can be used defensively too. 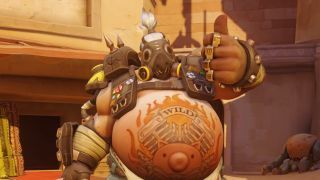 This time, Roadhog hooks a Zenyatta into a side room during his Transcendence ultimate ability. Enemies can’t be healed if the healer can’t get to them. It is the great quid pro quo of team games that if you watch your healer’s back, they will ensure your continued survival. Mei takes this responsibility very seriously when her Mercy is hit with an enemy Ana’s Sleep Dart. She shoots off an Ice Wall underneath the slumbering squishy, protecting both of them from harm. Teamwork! Reinhard is a one-man operation in this Capture the Flag match. Step 1: Use his Barrier Field to block opposing turret shows. Step 2. Use a carefully-navigated Charge to zip back to home base. Step 3: Profit. Normally, players will want to destroy the teleporter created by an enemy Symmetra. But this clever Junkrat sees opportunity, scoring up four solo kills by lying in wait with his Steel Trap and Frag Launcher.